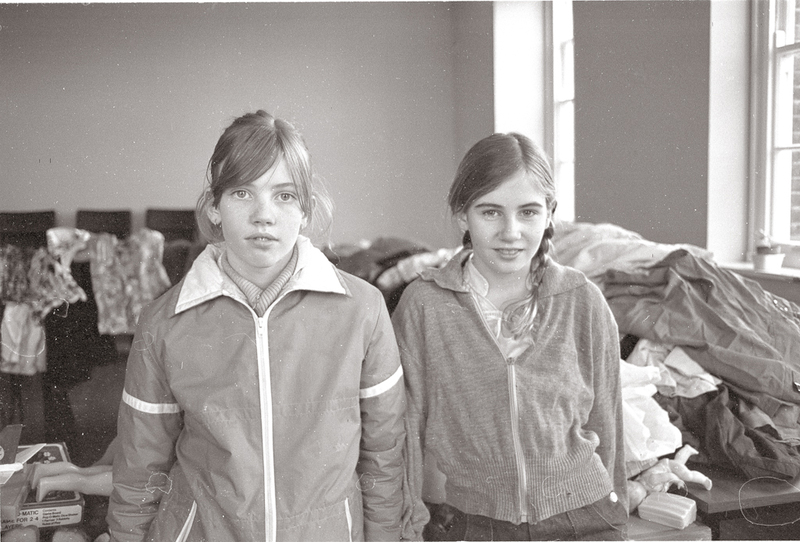 Remembering Marie A. (Bowie, broadcast). Remembering Marie A. (Bowie, studio). “Marie A.” was something of a” hit single” for Brecht as well. He sang it, accompanied by his own guitar, several times in public in the early Twenties. After being published in 1924, the poem was sung in several stage productions and recorded by Kate Kühl in 1928, and, a few years later, by Ernst Busch. While not written or intended for Baal, the song, being quite popular, was sometimes used in productions of it, including one of Baal‘s earliest 1926 performances. In the BBC’s revival of Baal, “Marie A.” was substituted for Baal’s coarse ode to sitting on the toilet (“a place that teaches you, so Orge sings/be humble, for you can’t hold on to things“). The setting is Baal’s favorite tavern, during an evening when he’s humiliating Emily, the society woman he’s recently seduced, while beginning his offensive on his next target, the virgin Johanna. The toilet song is used as a further debasement of Emily, but swapping “Marie A.” in its place changes the mood, suspending the sordid atmosphere for a moment. “Marie A.” is a quietly anti-romantic piece. The narrator begins by recalling a splendid late summer day in his youth that he spent with a long-departed love. But as the three-stanza verse proceeds, the memory fades: he claims that the girl means nothing to him now, nor ever did; he can’t remember what it was like to kiss her, or what her face looked like, or her last name. Instead, all that he really remembers is a cloud that he had spied for a moment, dissipating in the air as he watched it pass on that lost afternoon—a cloud that, vanishing just as it was born, has come to stand in his mind for everything he’s forgotten, everything since destroyed or worn-out (the wood’s been chopped down, Marie A. is likely now on her seventh child). For the BBC Baal, Dominic Muldowney again took as a start Brecht and Franz Bruinier’s original music for “Marie A.,” which used a soaring, romantic melody that the cold, disillusioned lyric seemed to mock—the vocal is a series of steady but aborted climbs that finally reach the top at the climax of each verse (on a high D, e.g. “it was quite WHITE”). I prefer the broadcast performance of “Marie A.” to the studio remake, as Bowie’s in wonderful voice for the former (even the odd garbled note on the final “moments” gives it character); his more genteel performance in the studio take seems weighed down by comparison. Baal was taped on 8-12 August 1981, BBC Television Centre; shown on BBC1, 2 February 1982. Studio version recorded in September 1981 at Hansa, Berlin; EP released 13 February 1982. Before he was a playwright, director, theorist or general undesirable (having to flee both Nazi Germany and the McCarthy-era USA), Bertolt Brecht was a poet, one whose works were meant to be sung to guitar. Brecht was inspired by performers he had seen in his native Bavaria, like Karl Valentin, a clown who was Germany’s answer to Charlie Chaplin, and Joachim Ringelnatz, a sailor/minesweeper turned poet and cabaret performer. Brecht’s poems were to be chanted or sung; they are often a kind of plainsong, as his future interpreter David Bowie once noted. While Brecht drew on classic German literature and narrative ballads, he favored mass-produced pop culture more than the “approved” folk music praised by the German middle class. Following unification in the 1870s, there was a vogue for Germanic folklore and mythology (this didn’t end well). For Brecht, much of this Volkslieder was fossil-music which had nothing to offer the working class of, say, 1915 Munich. As Brecht later wrote, working people have no wish to be Folk. Many of Brecht’s early poems were set to melodies of trashy pop songs, while in the Twenties, Brecht’s discovery of jazz (a new sordid American import, later restricted by the Nazis) would lead to works like Threepenny Opera. Baal, Brecht’s first play, is the culmination of his early work, the fruit of his youth in Augsburg, where Brecht was known for walking around town and in the woods, writing on scraps of paper that he kept in his pockets: the result was “the single, self-consistent poem whose stage expression was Baal “(John Willett). For Baal, Brecht recycled poems as dramatic interludes, in-scene performances or monologues in song (some, like the cruel “Legend of the Harlot Evelyn Roe,” were cut from the play upon revisions, while other poems would be swapped in and out, depending on the director’s choice (as we’ll see with “Remembering Marie A.”). In 1981, Bowie starred in a BBC revival of Baal and as his parting gift to RCA, he recorded five Baal songs for an EP (it’s a kiss-off to a label Bowie had grown to hate: “you thought Low was too uncommercial? Good luck selling this one“). Baal is often considered a strange cul-de-sac in Bowie’s career, a time-filling ploy while Bowie was waiting out his contracts. Only two of Bowie’s many biographies give Baal more than scant mention. * But Baal, after Scary Monsters, is Bowie’s best record of the decade; it’s another farewell to the performer he once was (for Bowie, the early Eighties was a series of strategic retreats, of closing down outposts) and a glimpse of the artist he could have been. In early 1981, the director Alan Clarke (best known for the vicious prison drama Scum) proposed reviving Baal for the BBC. Working with the producer Louis Marks,** Clarke planned to use split-screen to convey the Brechtian dramatic technique of characters addressing the audience during the play. Looking for a lead actor, Clarke and Marks recalled Bowie’s recent success in The Elephant Man and correctly guessed that he had some interest in Weimar Germany; after visiting him in Switzerland, they offered him the role, for which he received the standard BBC scale of £1,000. During rehearsals, Marks and John Willett (who wrote the script, a fine, sharp translation) were stunned to find that the rock star they had recruited knew as much about Brecht and Weimar Germany as they did (and Willett had just finished assembling Brecht’s poems in their definitive compilation). 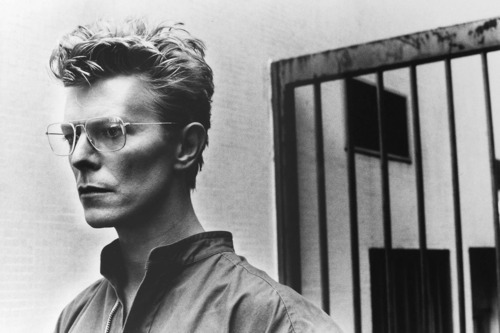 His years of isolation in Los Angeles, with Bowie obsessively reading whatever he could find on Weimar, and his immersion in Berlin in 1976-77 had turned Bowie into an amateur scholar. Sure, Baal was a way for Bowie to keep busy during a deliberate period of slack, but it’s too well-chosen a role for just that. Baal is a prototype rock star, a Weimar-era Ziggy, marked by his callousness, charisma and all-consuming need to devour all he sees, from the women that he tumbles into bed to the clouds that he spies in the forest sky. Portrayed by Bowie as a shabby East End bohemian, Baal seems like one last incarnation of a greedy, world-shattering youth, one marked, as Bowie’s had been, by a cold observant eye to match a ravenous appetite. It’s the angry, self-righteous, devouring voice of “Cygnet Committee,” heard again but now encased in a stage performance, preserved as a keepsake. Dominic Muldowney wrote music for it, using as the melody an uncredited piece included in Brecht’s 1927 Die Hauspostille: an 8-bar refrain in G major whose vocal melody rises in thirds for each line (the singer first keeps on E, then G, then B, culminating in the octave E on “MARV-eh-lous“). 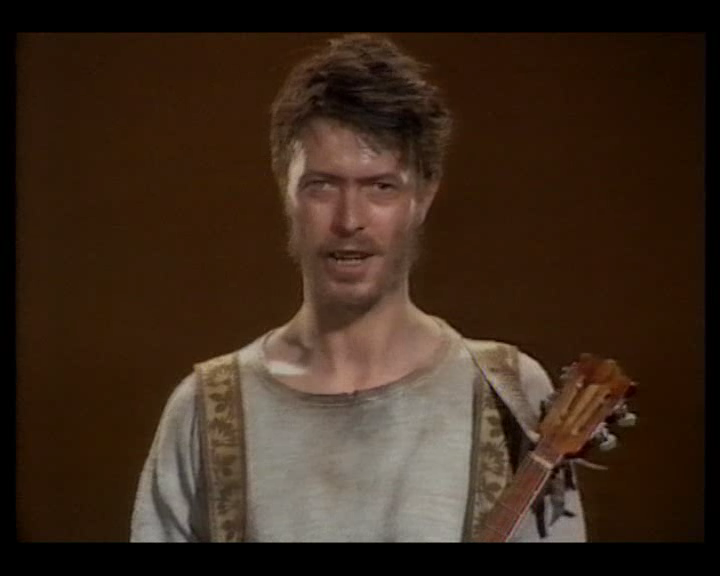 The BBC performance of “Baal’s Hymn” is just Bowie and banjo, serving as a needling, harsh commentary on the performances or intertitles flashing by in the right-hand frame of the split-screen. 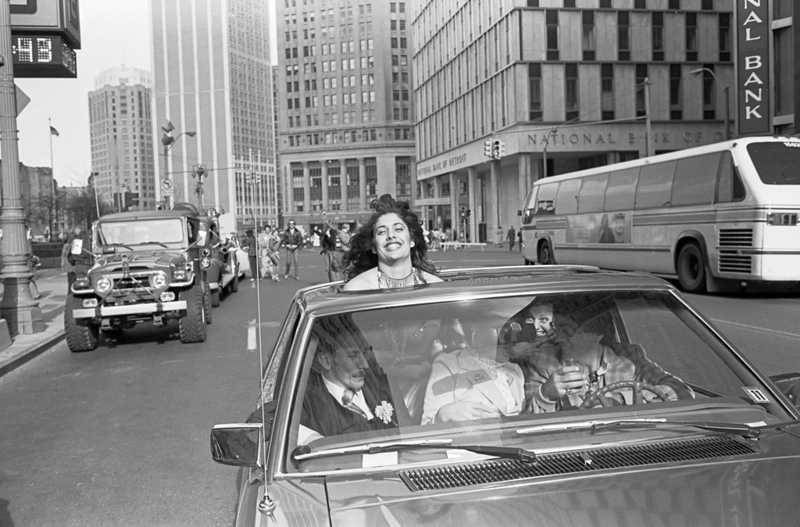 For complete version of the “Hymn” that Bowie recorded in Berlin a month later, Muldowney and Bowie had to rethink the song as a unified performance. Bowie had convened Willett, Muldowney, Tony Visconti and Edu Meyer to record the Baal songs at Hansa Studios in Berlin in September 1981. Visconti said Bowie described the session as being a “souvenir,” merely recording the songs for posterity. The Baal session was also another farewell: it would be the last Visconti Bowie production for nearly 20 years, and the last time Bowie ever recorded in Berlin. Muldowney scored the Baal songs for a 15-person band of Berlin musicians (mainly one musician per instrument (violin, viola, trombone, trumpet, cello, etc. ), so to get a “German pit orchestra” sound, Visconti said), including the percussionist Sherry Bertram and “a 75-year-old bandoneónist who’d played in the first productions of the Threepenny Opera” (Trynka), Muldowney was startled to hear what Visconti was doing to the mix, compressing and flanging the recorded instruments, so that “four strings sounded like four tanks,” he told Trynka. Bowie had wanted to sing live with the band, but he had showed up late to the session and, as these were German union musicians, the session needed to start and end on time. Bowie was happy to be tardy, as listening to the musicians gave him a chance to “mentally rehearse” his vocals, Visconti said. The studio “Hymn” uses Bowie’s voice in the way a jazz ensemble would a lead saxophone—sometimes working in support of the group, sometimes as a wild soloist. The opening three stanzas are similar to the BBC production, with Bowie, using a very free meter that lets him extend or shorten lines as he sees fit, at first set only against piano, with the full band coming in as the verses go on. A brief interlude, then a second phase, with Bowie now singing in a march-like fixed meter, chained to the rhythms of the piece. A second interlude triggers the return of the initial free-ranging performance, with Bowie let off the leash again (listen to how he bites into “nothinggg could be HARD-er than the QUest for FUN“). After another interlude, Bowie is conscripted again, but he resists more now, capping off one verse with a gleeful “vulture SOUP!”. And the Hymn ends with Bowie free but bloodied, offering one final burst of defiance with the long-held “marvelous!” before he expires. For Bowie’s vocal, Visconti and Meyer used the “Heroes” strategy of having several mikes placed around Hansa’s enormous Meistersaal, to capture Bowie’s voice at different levels and imbued with room ambiance. Bowie cut all of his vocals for the EP in a few hours. Then he took Muldowney on a guided tour of Berlin low-life, including transvestite bars and New Wave clubs; it was a night out with a Baal who had reached a comfortable middle age. Baal was taped on 8-12 August 1981, BBC Television Centre, and was shown on BBC1 on 2 February 1982. 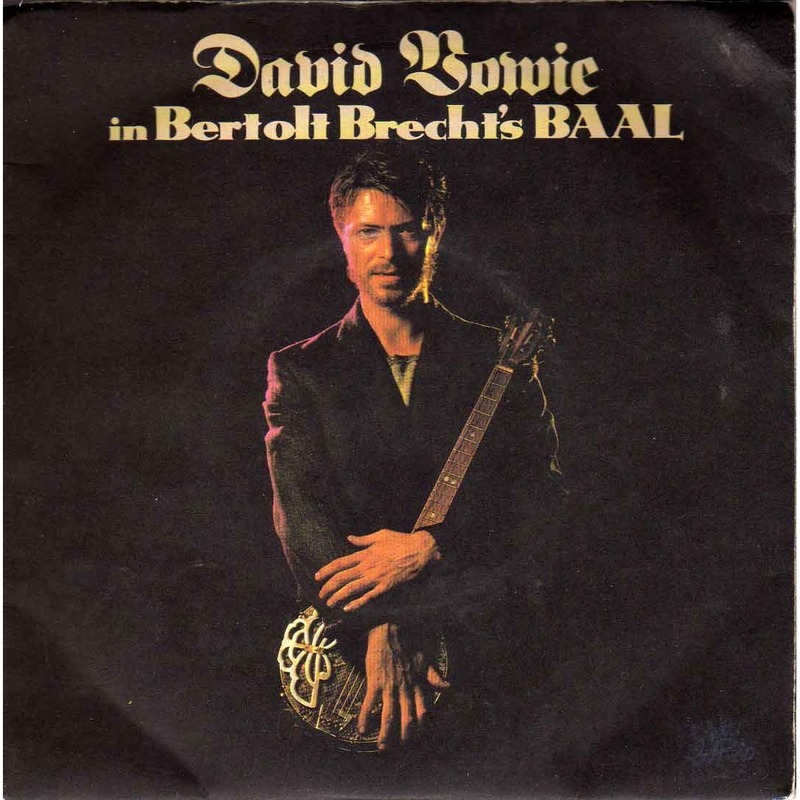 *** The studio take of “Baal’s Hymn” was recorded in September 1981 at Hansa on the Wall, Berlin; released on 13 February 1982 on the EP David Bowie in Bertolt Brecht’s Baal (RCA BOW 11, #29 UK). “Baal’s Hymn” was later collected on the revised Sound + Vision. ** Marks, who died last year, was a BBC stalwart, even writing four Doctor Who scripts. *** Unfortunately only the first 30 minutes (from someone’s off-air videotape) have turned up on Youtube. Why the BBC has never released Baal on either VHS or DVD at some point in the past 30 years is baffling; maybe it’s a rights issue (Brecht’s early poems are public domain, but not Baal). A complete version of the off-air tape is circulating, though the picture/sound is pretty dismal. Top: Bowie as Baal, video and vinyl, respectively. You are currently browsing the archives for the Baal EP: 1982 category.